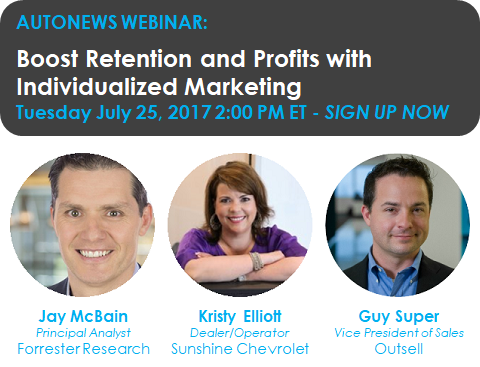 Outsell announced today that it has partnered with Automotive News to host an upcoming webinar titled, “Boost Retention and Profits with Individualized Marketing.” The free, online event takes place Tuesday, July 25 at 2:00 pm ET. Savvy automotive marketers are looking for new ways to better understand how to leverage the Internet of Things (IoT). In order to be successful and stay ahead of the game, it’s necessary to apply the IotT’s network connectivity to gather and share data that supports a more advanced and targeted marketing strategy. The automotive industry is potentially a huge benefactor of this level of connectivity and marketers in this field realize that a good customer experience comes from consistent personalized attention and dependability. Today’s artificial intelligence solutions can offer the automated, tailored one-on-one engagement that consumers demand with the steady stream of communications necessary to keep them engaged throughout their lifecycle, which can ultimately improve a dealer’s bottom line with increased retention and profitability. Featured speakers Jay McBain, Principal Analyst, Forrester Research; Kristy Elliott, Dealer/Operator, Sunshine Chevrolet; and Guy Super, Vice President, Outsell will explore how the IoT impacts the day-to-day challenges marketers face.